How much do you love repurposing projects? They are among my favorite DIY things to try and I’ve found a wonderful collection of repurposing ideas for your old flannel shirts. If you’re like me, you have so many clothes hanging in the closet that you never wear. You may plan to throw out those worn out or torn shirts but first, take a look at these 25 creative ways to reuse them. Whether you’re planning your Christmas decorating already or you want new jewelry or even a great new stuffed toy, there is a way to incorporate flannel into every aspect of your life. Seriously, there is something in this collection of projects for everyone who loves the look and feel of flannel. 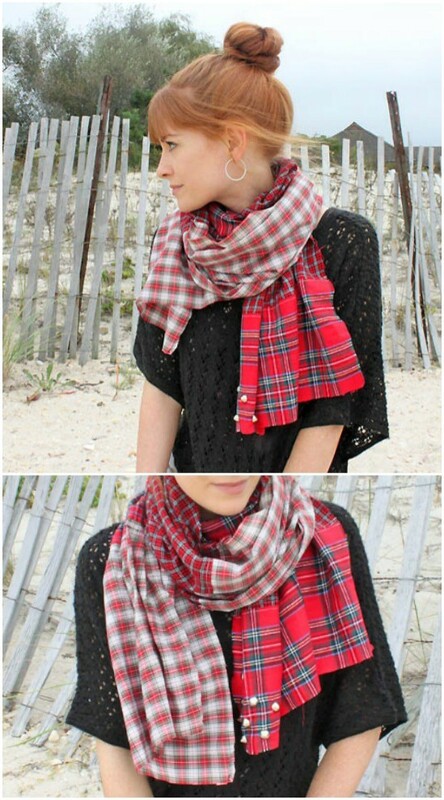 There’s a wonderful flannel scarf that is so gorgeous and so warm. And, if you love scarves, be sure to take a look at this collection of 26 cozy infinity scarves that you can easily DIY. Repurposing projects are my all-time favorite. I absolutely adore taking old clothing and making something new and exciting with it. From great wine cozies to farmhouse style Christmas ornaments, we’re going to put those old flannels to great use and you’ll have a great time doing it. Speaking of repurposing old clothing, there is a great list of 20 upcycling projects for old baby clothes that you should totally check out. Now, let’s get back to using those old flannels. Whether you want to make a quilt or pillow covers or honestly just about anything else for the house, you’re sure to find the perfect project in this collection. And, most of these are no sew projects – although there are a few that may require your sewing machine. You’re bound to find a great DIY repurpose for all of those old flannel shirts, and I can’t wait to hear what you’ve made! I have to admit, I am a huge fan of bracelets – all bracelets, which is why I really love these cuff bracelets covered in flannel. These would be the perfect accessory for a denim shirt or just about anything else you want to wear. To make them, you just cover a chunky wooden or plastic bracelet with flannel. Glue the flannel in place with fabric glue or a hot glue gun. 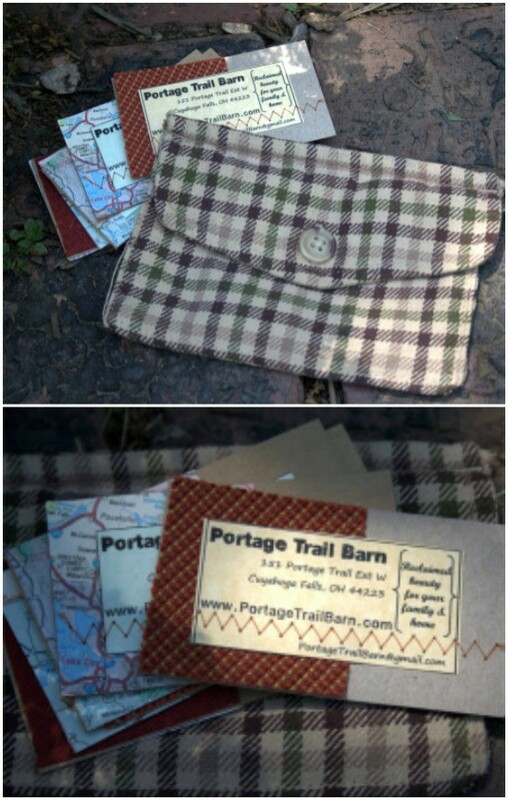 These would also make wonderful gifts for anyone you know who adores flannel. 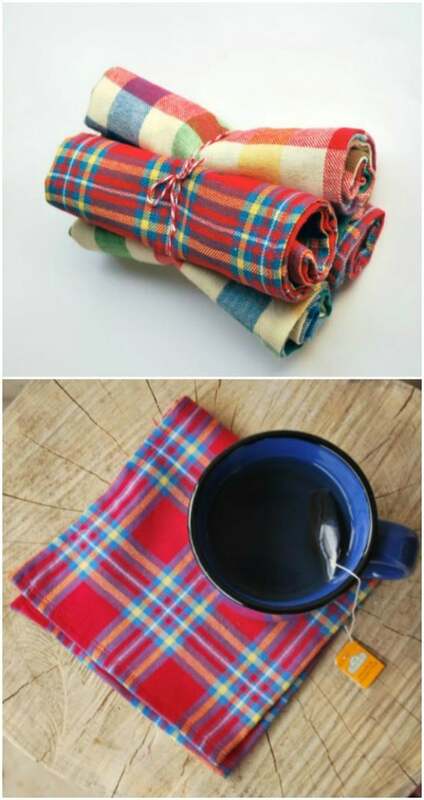 While you’re using up the body of that old flannel shirt for other projects, use the cuffs for these adorable cup cozies. Just cut the cuffs off, hem them up a bit if you want, and fit them over your cups. These are also great gifts and the buttons make such wonderful looking embellishments. 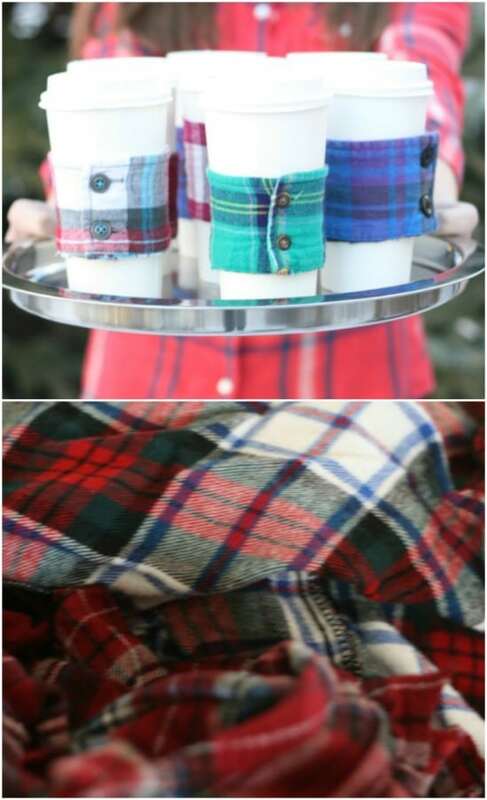 FYI, the cuffs of most flannel shirts will fit perfectly over paper coffee cups or those cute little plastic ones that you can get at the Dollar Store. 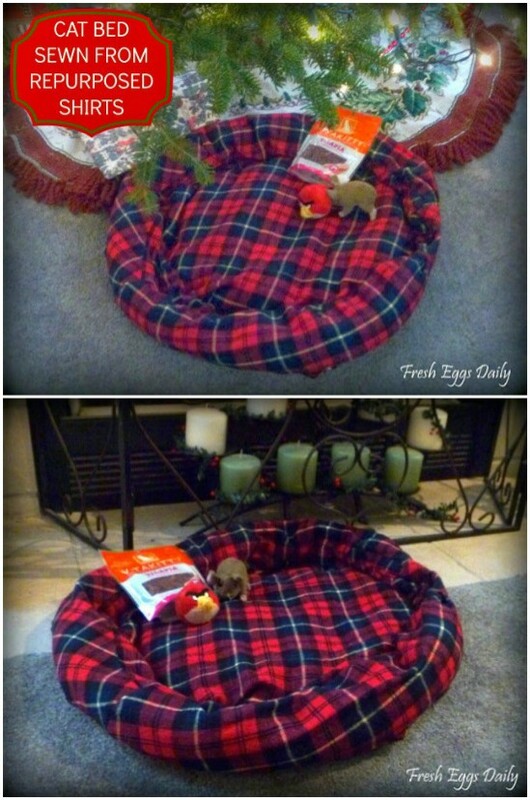 Your little dog will love the warmth of this easy to sew coat that you make from an old flannel shirt. I love the collar and pocket, but the pattern allows you to not use those if you prefer it that way. It would make it a bit easier to sew but then again, I just can’t get over how adorable this little doggie coat is with the pocket! You can probably adjust the pattern for sizes if needed and if you really want to get creative, toggle it enough to make a coat for your large dog. If you’re going to upcycle, what better way than to make these gorgeous napkin rings? I love flannel in general and never would have thought to add it to the dinner table. For two rings, you need an empty toilet paper roll, your old flannel shirt and some sisal rope. These inexpensive rings look amazing and would be the perfect way to dress up your fall dinner table. If you’re a fan of cloth napkins, these flannel napkins are really going to make you smile. They’re uber soft and so very easy to make. Put that old flannel shirt to really good use when you make these napkins. There’s a bit of sewing required for these but you could forgo that and just use fabric glue if you prefer. These are really nice napkins and would look great adorning that fall dinner table. 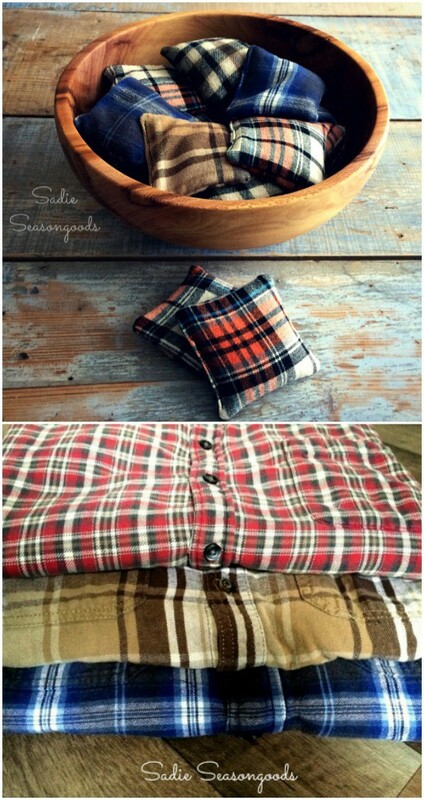 You can make so many of these reusable hand warmers with just one flannel shirt! If your hands tend to get really cold during the winter or you work outside a lot in the colder months, these hand warmers are the perfect craft project. They’re all really soft since they’re made of flannel and the flannel helps to keep them warmer longer. You know you want a few of these in your pockets this winter! 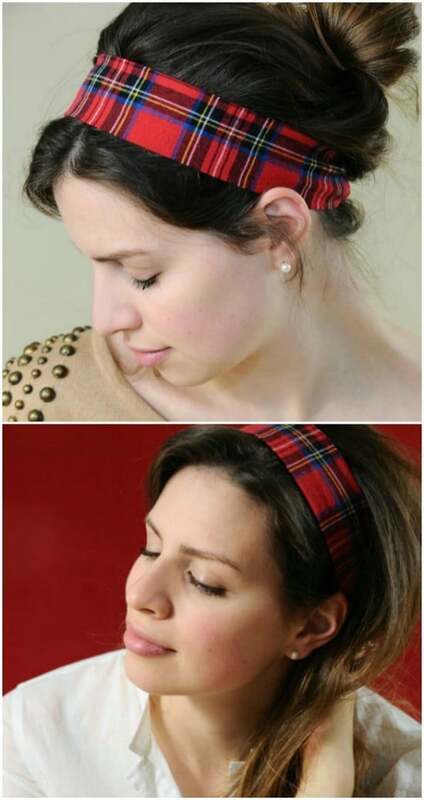 This flannel headband is perfect for wearing with denim or other flannel. You just cut a strip from that old flannel shirt and sew. It’s such an easy headband that you can complete in no time, and you could have one in a variety of colors if you have more than one flannel shirt to reuse. Since you only need a piece, you can still make other projects from the remainder of the shirt. To get the great pattern in this holiday wreath, you’ll want more than one old flannel shirt. But, you don’t use the entire shirt so save the rest for other projects. This is almost too easy. 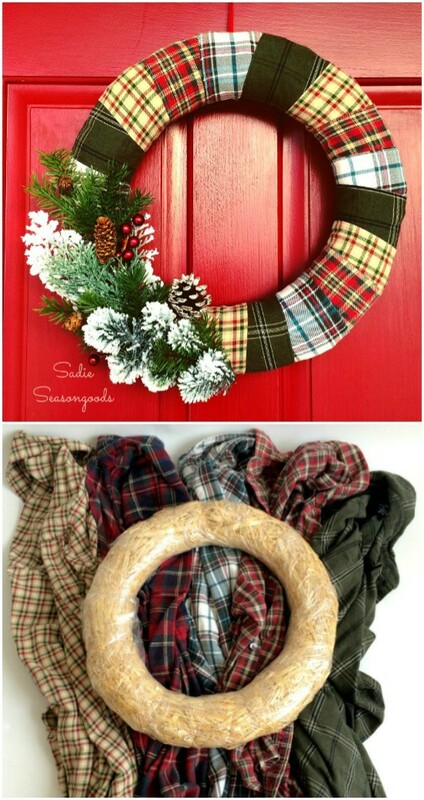 Just take a wreath form, one of those thick straw ones, and then layer your flannel. Cut strips of each shirt and wrap them around the wreath, creating whatever design you want. You could use just one shirt and make it all one color, but I think the multiple designs are just gorgeous. 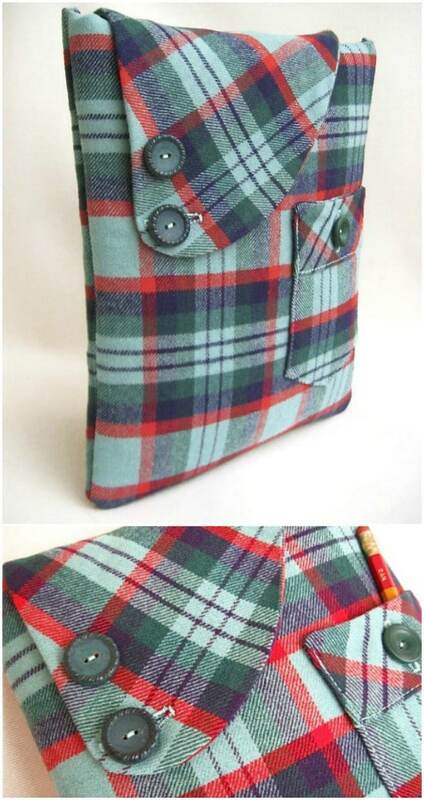 This adorable flannel iPad case is on Etsy, but I think it would be really easy to make yourself. Just cut your flannel in the right size and sew. There are so many tutorials for making iPad and iPhone covers. Use one of those and instead of buying fabric, just use the fabric from your flannel shirt. The soft material will help to protect your iPad and it’s quite the fashion statement. 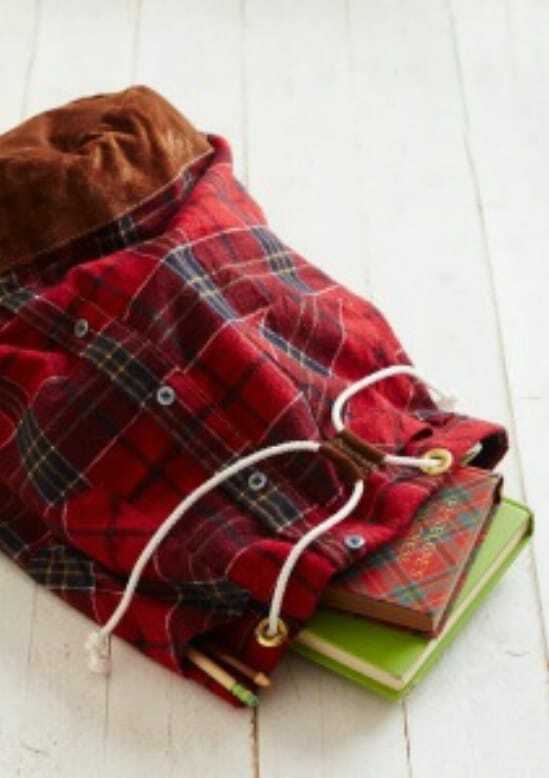 This knapsack is great for carrying books to school or for any number of other uses, and you can easily make it yourself. There are a lot of steps but each one only takes a few minutes. The overall project is really easy from start to finish and you’ll end up with this really neat bag. It’s even got a great drawstring, which is really easy to put in. How about some really warm mittens? When I say warm, I mean really warm. These mittens have flannel on one side and fleece on the other. They’re totally reversible and each side is soft and warm! 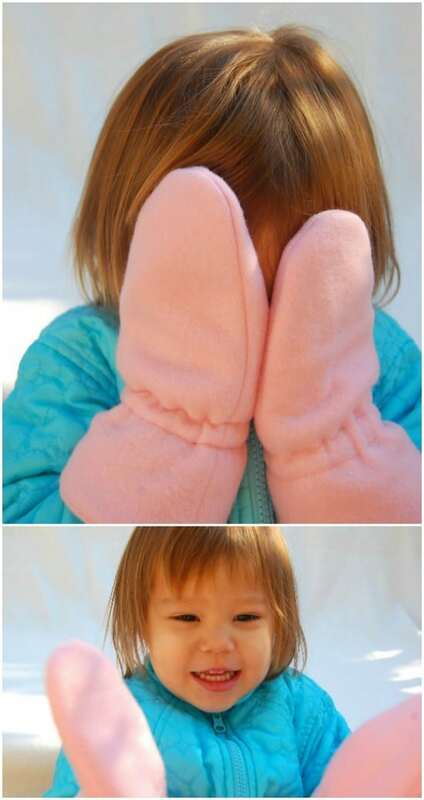 You can easily fit each of your kids with warm mittens by just tracing around their hands for your pattern. If you don’t want the fleece, you could do flannel on both sides but then again, you could always just turn the fleece inside and let the flannel show. This pet bed says for cats but little dogs will love it just as much. Plus, you could make it larger or smaller as needed. It’s made from an old flannel shirt and a t-shirt. Your pet is going to adore you for this! There’s a bit of sewing required but you end up with a bed that would easily rival those $50 pet beds you’ll see at Walmart and you get to give your furry friend a warm and cozy place to sleep. 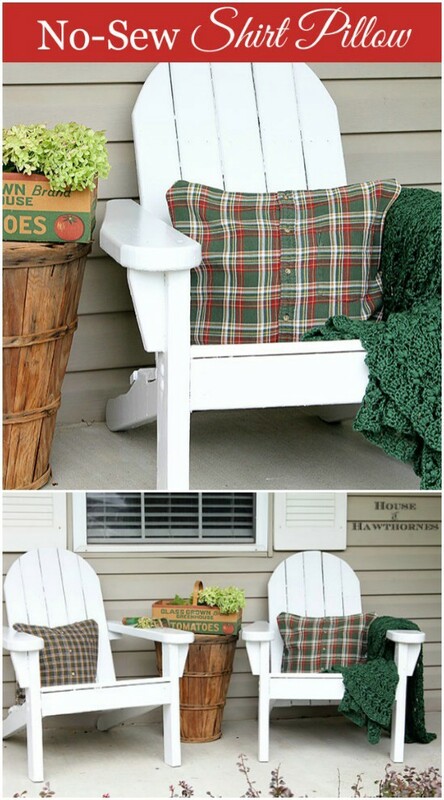 Dress up your porch for fall with these wonderful no sew flannel pillow covers. Did I mention that there’s no sewing involved? I love an easy project and love it even more when I don’t have to get out the sewing machine to complete it. These pillow covers are quite possibly the easiest thing you will make all year, and they are so adorable. Personally, I would leave the pockets showing to give them a bit more rustic looking appeal, but you can use the other side of the shirt as well. I love the idea of making his and hers quilts and using those old flannel shirts in your husband’s closet is the perfect way to get his. If you love quilting, this is a great project. Quilting does take a bit of time but it is so worth the effort when you have that quilt for cozying up in during the winter months. Make this quilt by cutting squares from your old shirts and then piecing them all together in true quilt fashion. Scarves are my thing. I own so many and wouldn’t mind owning a few more. In fact, I’ve got a stack of flannel shirts just ready to make this amazing flannel scarf. This is really easy to make, too and it’s so stylish. You could add embellishments and even alternate soft denim with the flannel if you wanted to be a bit creative. Overall, this is probably the easiest scarf you’ll ever make and one of the warmest, too. One of my favorite things is redoing old chairs. 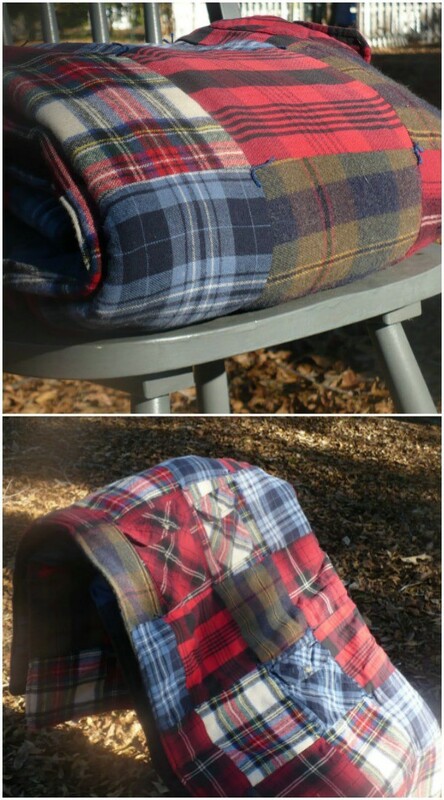 This one is gorgeous with its flannel seat that you can easily make from an old shirt. Instead of throwing out that old chair that’s just too uncomfortable to sit on, make a comfy seat for it with an old shirt and some filling. You can find old chairs like this at thrift stores for just a couple dollars each and create an entire dining room seating area from those old shirts. Flannel and lace look gorgeous together and they really stand out in this table runner. Use a couple of old flannel shirts to get a unique design and when you join the flannel pieces together, add some lace for a beautiful effect. If you’re looking to add some farmhouse charm to the dining room, this is a really cheap and easy way to do it and it would make a wonderful runner for Thanksgiving. What a great project! 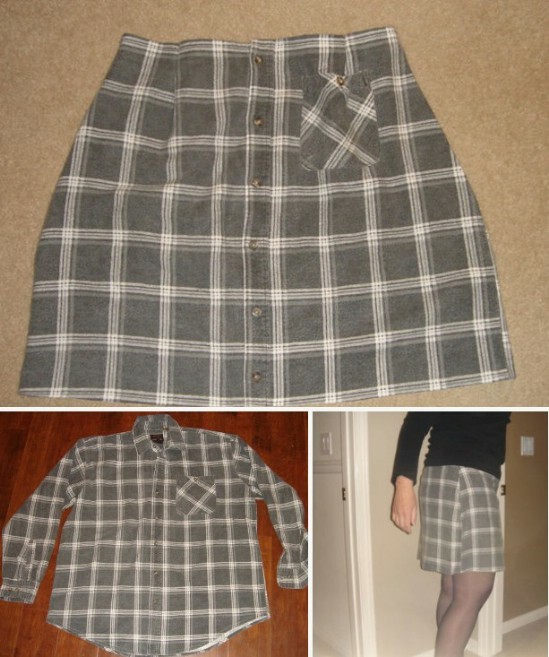 This little flannel skirt would be adorable with leggings and low boots and you can make it from that old flannel shirt that’s been hanging in the closet for years. The skirt is warm and you can add the pockets to make it really stylish. This project is much easier than you would think and it only requires one shirt to make it. 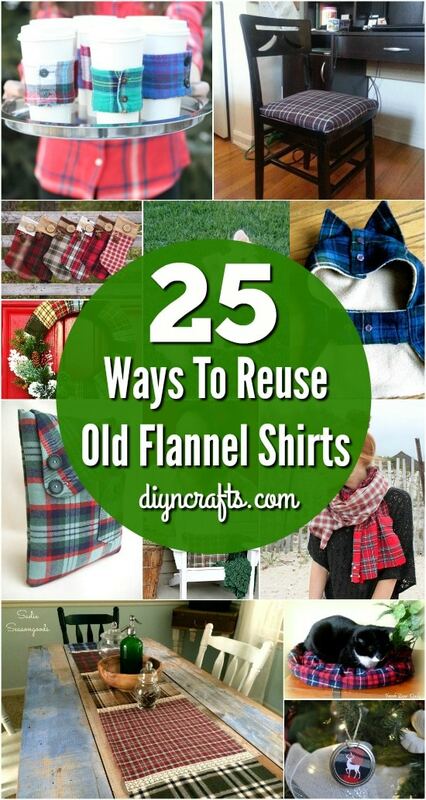 Don’t throw out those old flannel shirts. Use them to make these awesome gift tags instead. You’ll need cardstock for the tags as well as spray adhesive, a circle punch, and a few other supplies, along with your collection of worn out flannel. These are perfect for adding to your country themed gifts and are really easy to make. 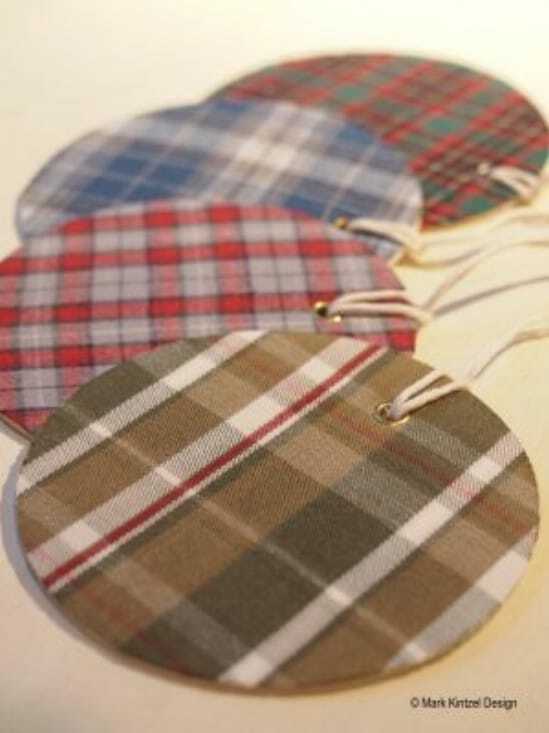 Your gift recipients will adore getting these homemade tags in a flannel theme. If you need somewhere to keep those business cards safe and handy, and you’re a fan of flannel, you can turn that flannel shirt into a stylish business card holder. You use the shirt pocket to make this card holder, so you’ve got the rest of the shirt to create other cool flannel projects. This is the most adorable card holder I’ve ever seen and it’s so very easy to make. Plus, there’s a great tutorial here for making your own business cards out of cereal boxes. How cool is that? If you’re looking to really country up your home this coming Christmas, these ornaments are perfect. They’re made from your old flannel shirts and mason jar lids. It’s a repurposing project that lets you use up a couple of things that you may normally throw out. These little ornaments are adorable and they’re really easy to make – that’s the best kind of project, right? 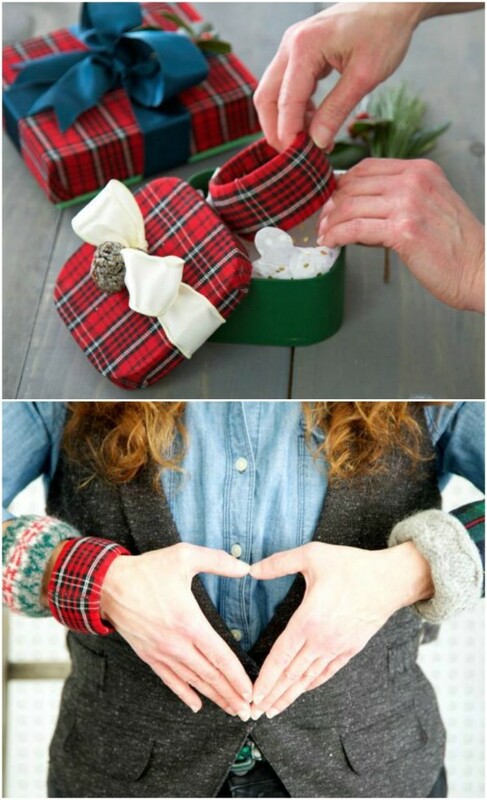 Just fill the hold of the lid with flannel and then add trinkets or other embellishments and hang with twine. 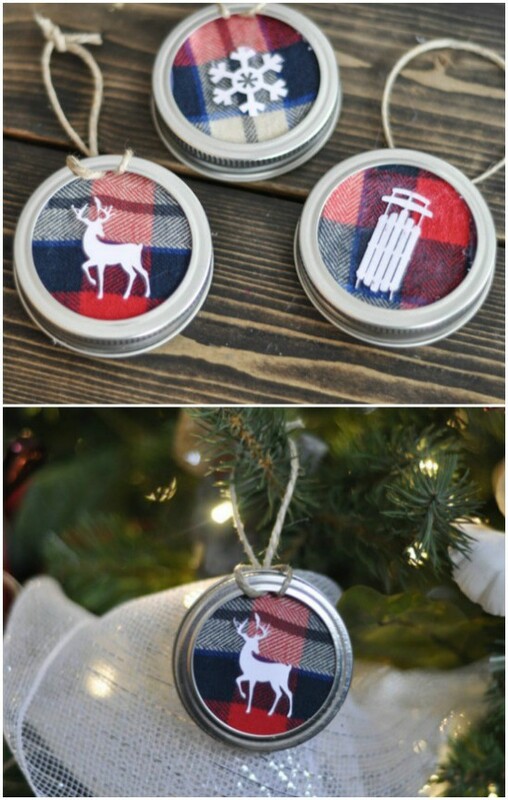 Here’s another great idea for flannel Christmas ornaments. These are a bit more traditional but they still bear that wonderful farmhouse country look. You use Styrofoam balls and then cover them with the flannel material from your old shirt. You can get several ornaments from one shirt, depending on the size. Then tie the whole thing up with a pretty satin ribbon and maybe add some decorations like old buttons. Oh, and this one is a completely no sew project! 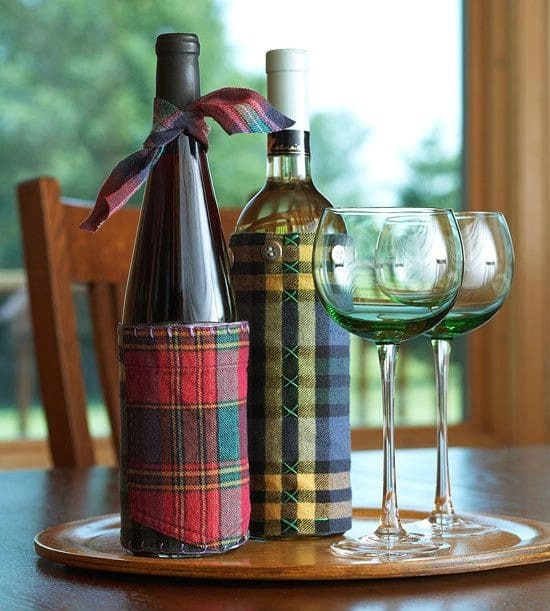 If you tend to give wine as a gift, these flannel DIY wine cozies are great. They’re also really easy to make. You could use the cuffs from your old shirts to make them or if you want to make several from the same shirt, just cut strips in the size that you need and sew or use fabric glue to hold them all together. Add a few buttons, some twine, or even ribbons to decorate and you’ve got a gorgeous wine cozy that will dress that wine bottle up beautifully for gift giving. You know you want to make this adorable little flannel bunny. 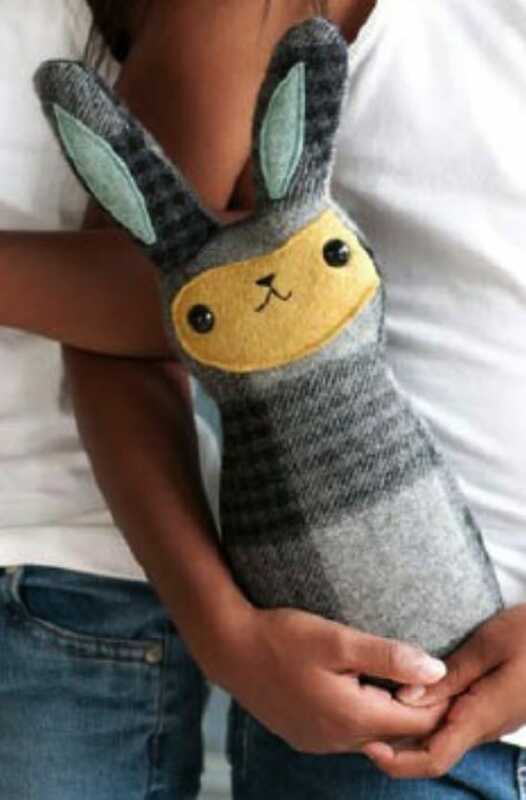 This little stuffed bunny is a really easy project that won’t take you long at all and he’s perfect for decorating at Easter or giving as a gift to any child in the family. This is really an adorable way to use up those flannel shirts, and you could alter the pattern to make different animals and have an entire flannel zoo if you wanted. Really turn your home into a country Christmas zone when you add these flannel stockings to your decorating. I realize Christmas is not that close, but that gives you plenty of time to get these done. I found these on Etsy but they look really easy to recreate. Just use a stocking pattern or make your own. You can make a flannel stocking for everyone in the family and have that great farmhouse look this holiday season.